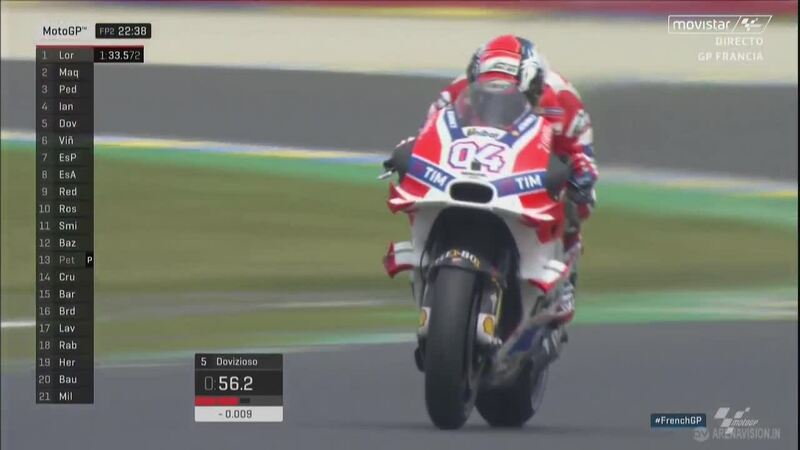 Jorge Lorenzo with a clear advantage over the rest of the field in Le Mans, Iannone and Marquez the only riders within half a second. 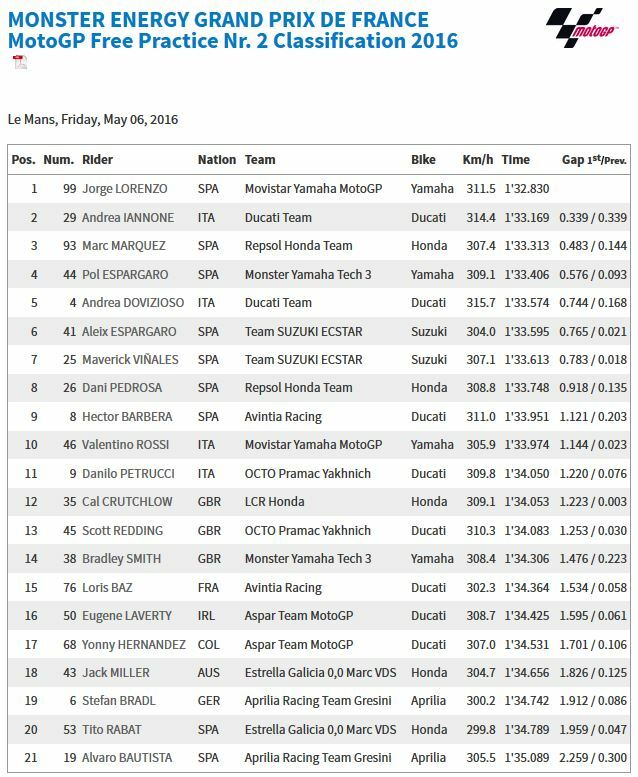 In the morning session it was Dani Pedrosa (Repsol Honda Team) who led the way with a 1’34.042, the Spaniard showing well after a fruitful test in Jerez. 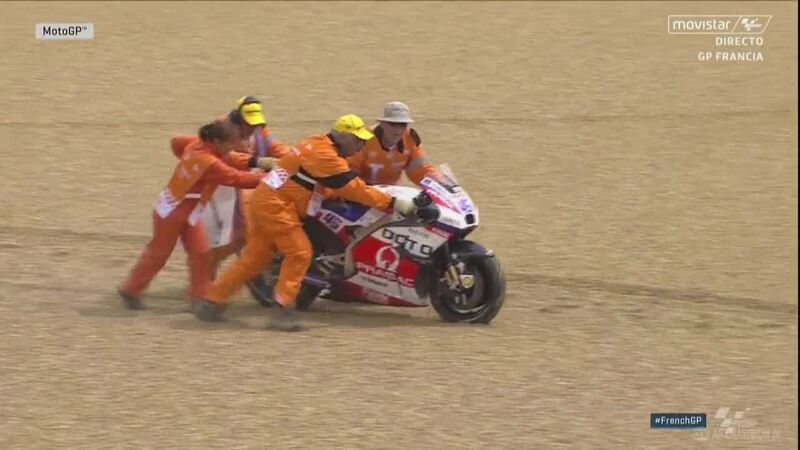 His time wouldn’t stand for long as riders were immediately pushing in the second session. 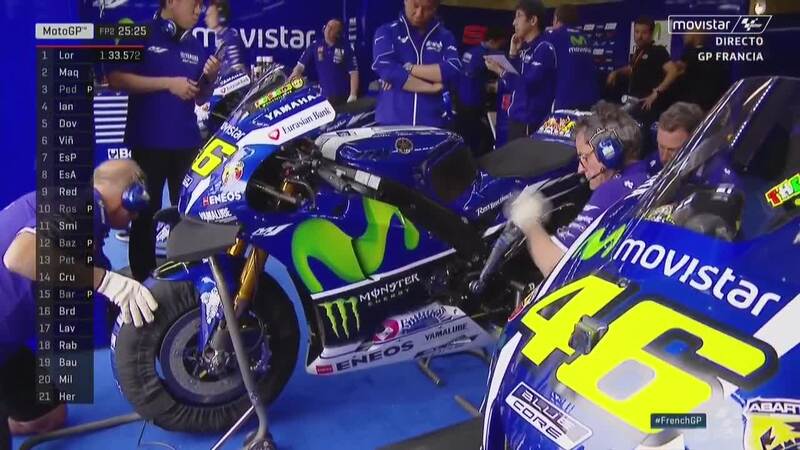 Free Practice 2 for the MotoGP™ World Championship began with Jorge Lorenzo (Movistar Yamaha MotoGP) setting a string of fast laps. Clouds began to gather overhead as the session got underway, the rain fortunately holding off and allowing all the riders to improve their times. Results from Free Practice 2 could be vital for passage into Q2 as the morning sessions in Le Mans are often quite cool. After his blazing start to the session, it came as little surprise that Jorge Lorenzo concluded Free Practice 2, and the day as a whole, as the fastest rider. 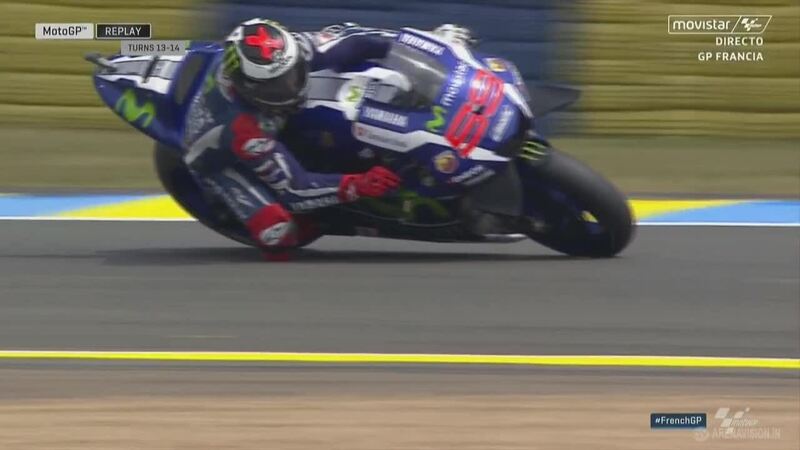 Lorenzo’s fastest time, a 1’32.830, came towards the end of the session. The only rider in the 1’32s, Lorenzo leave the Le Mans circuit on Friday evening with a 0.339s advantage over Andrea Iannone (Ducati Team). 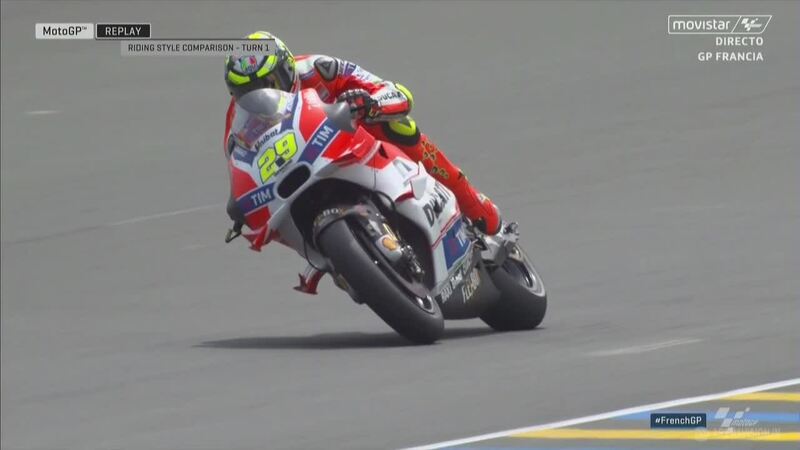 The Le Mans circuit has often seen Ducati riders perform well, Andrea Iannone continuing the tradition as he wrapped up Friday in second place on the combined timesheets. 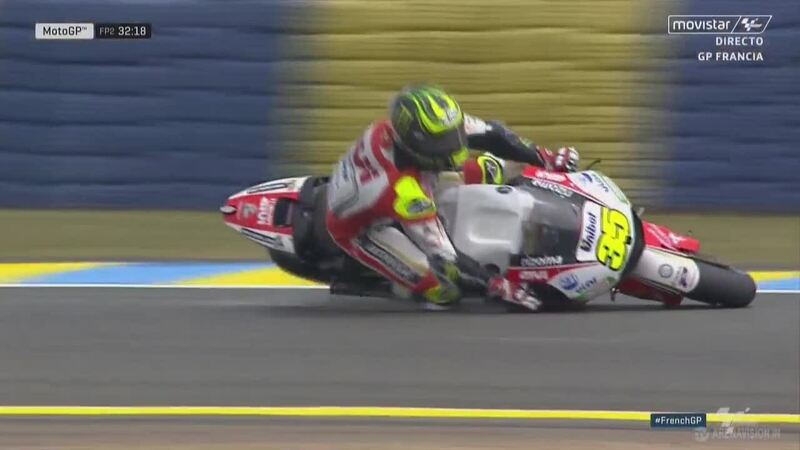 Iannone’s best time came on his final lap of the day, the problems of Jerez long gone for the Desmosedici GP. 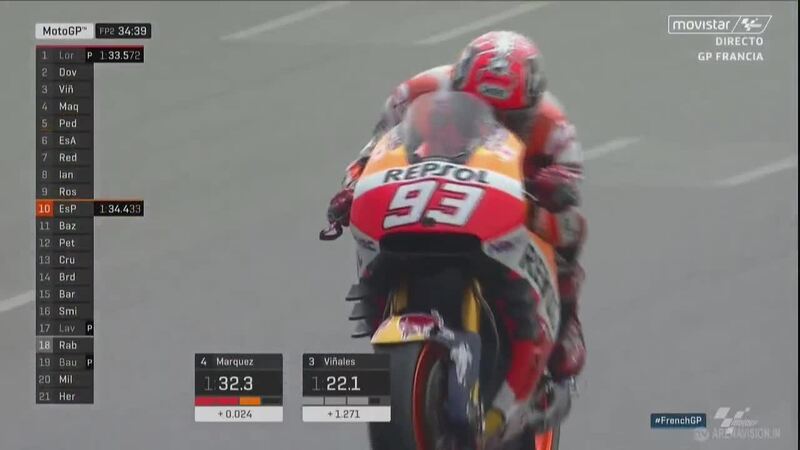 Once again it was Marc Marquez (Repsol Honda Team) who completed the top three, the final rider able to get within half a second of Lorenzo’s time. Marquez’s performance made it three different brands inside the top three, proving that a variety of styles are competitive at the French GP. Pol Espargaro (Monster Yamaha Tech 3) achieved his first, and so far only, MotoGP™ front row start in Le Mans during his rookie campaign. 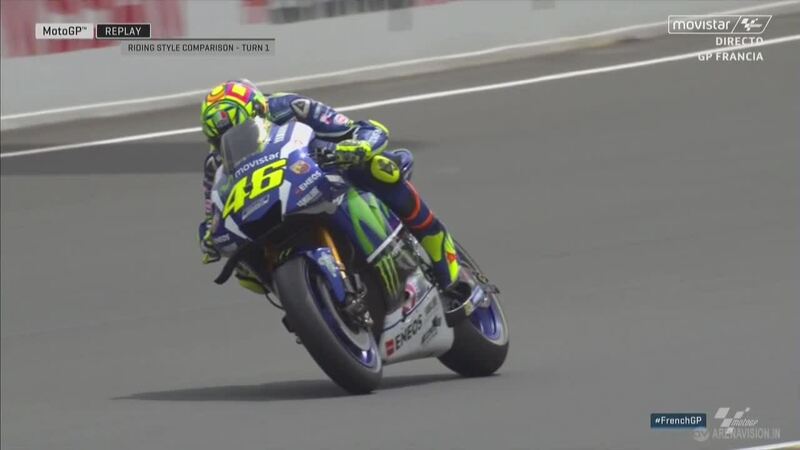 After a troublesome year in 2015, the Spaniard is again performing well and concludes Friday at his team’s home race in fourth and as the leading Independent Team rider, ahead of Rossi on the factory bike. Andrea Dovizioso (Ducati Team) completed the top five, making Ducati the only factory team with both their bikes inside the top five. The Italian was 0.744s back on Lorenzo’s time as he looks to maintain a run of five straight front row starts in France and shake his bad luck from the start of the year. 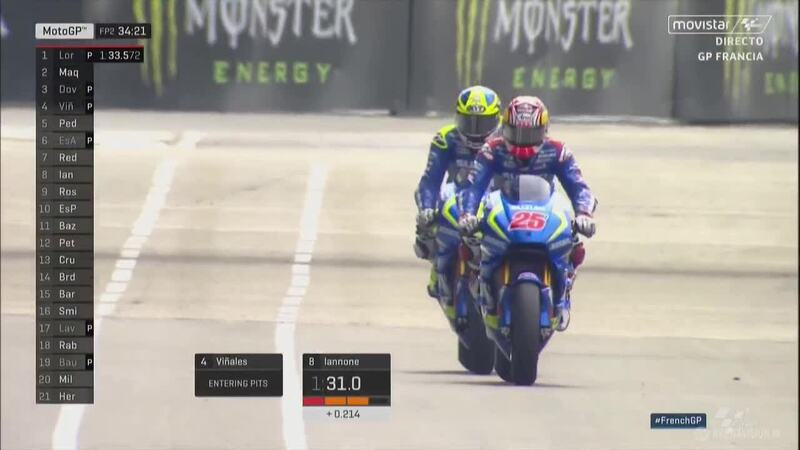 Aleix Espargaro (Team Suzuki Ecstar), Maverick Viñales (Team Suzuki Ecstar), Dani Pedrosa (Repsol Honda Team), Hector Barbera (Avintia Racing) and Valentino Rossi (Movistar Yamaha MotoGP) rounded out the top ten. 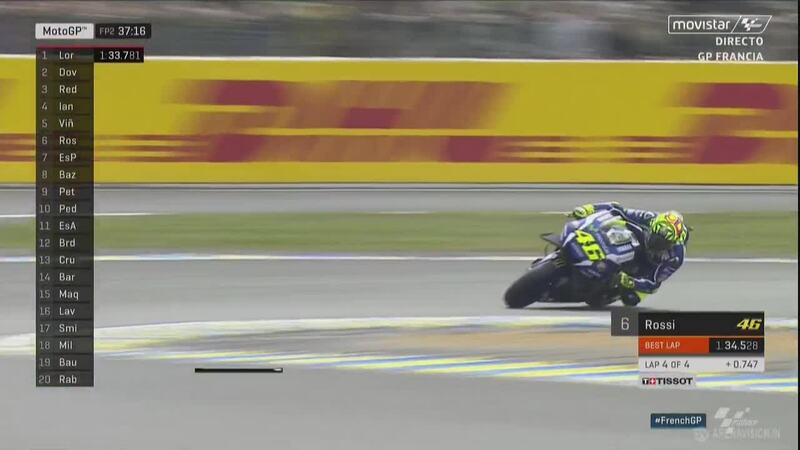 While Lorenzo improved his time from FP1 by 1.2 seconds, Rossi was only able to improve by half a second and ended 1.1 seconds behind his teammate. Danilo Petrucci (Octo Pramac Yakhnich) concluded Friday in 11th on his MotoGP™ return after injuring his hand in both the Phillip Island test and the Qatar GP. Cal Crutchlow (LCR Honda) was the victim of a crash at Turn 13, jumping to his feet and jogging back into the pits for his second RC213V. 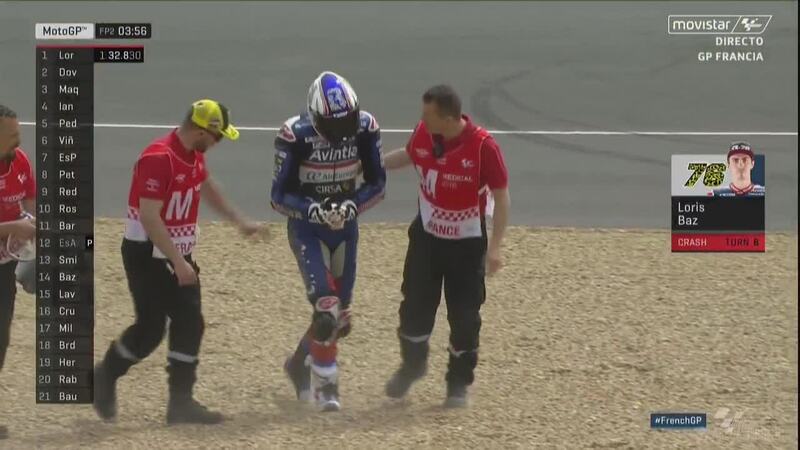 It was a difficult day overall for Loris Baz (Avintia Racing) as he suffered a second crash, coming off at Turn 6 with less than five minutes of FP2 remaining. On his final lap of the day, Scott Redding (Octo Pramac Yakhnich) crash at Turn 7, removing any chance he had of getting into the top ten. 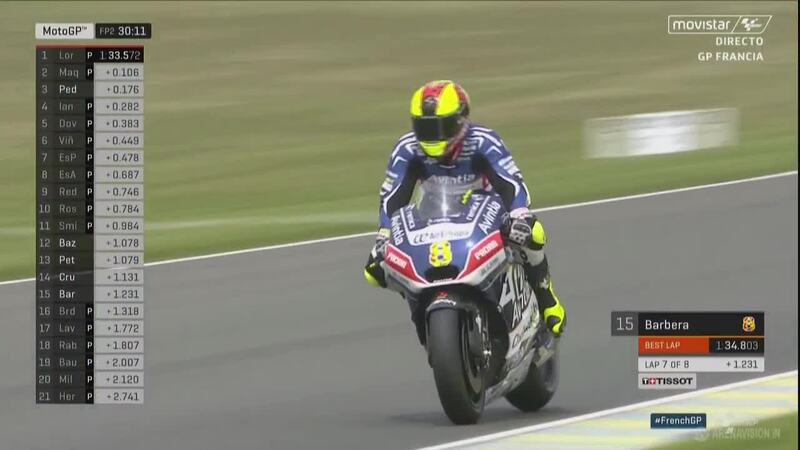 After his win in Jerez last time out, the ‘Doctor’ is aiming for his first back to back race wins since 2009, but things didn’t quite go as planned on Friday at Le Mans. It start well enough with the Italian toping the timesheets just a few minutes into the FP1 session, but was later held back due to stability issues on his bike. He went on to look for a good tyre and settings combination and improved throughout the session to finish in fifth place with a 1’34.452s lap, 0.410s from the front. 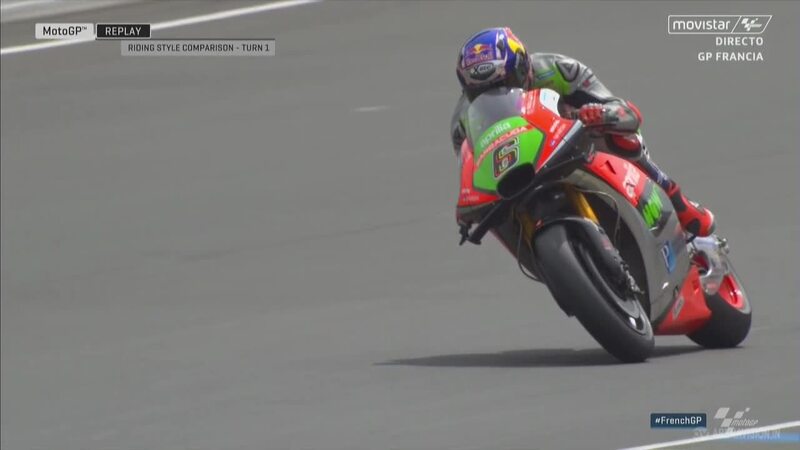 He continued to focus on improving the balance of his bike in the afternoon and was able to better his pace. 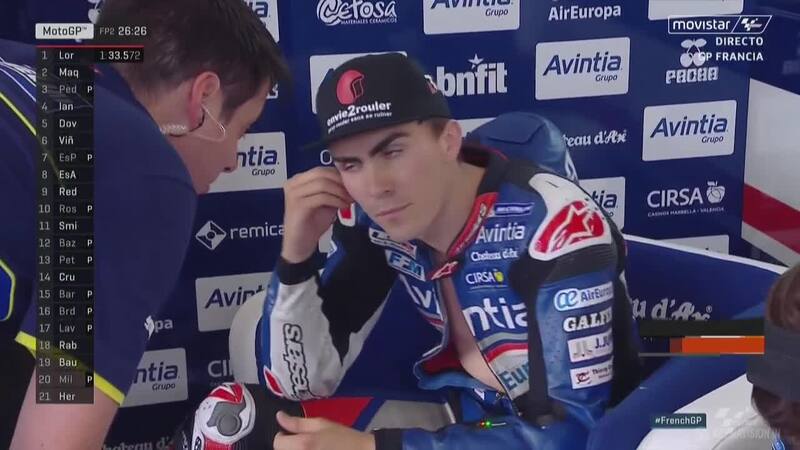 Having found his rhythm at the end of the session, he was riding laps under the 1‘34-mark with a best lap of 1‘33.974s but was unable to climb up in the ranking order and wrapped up the day in tenth place, 1.144s behind his teammate. Marc Marquez finished Friday’s practice in Le Mans third overall on the timesheets, but admits that it was not easy. The current MotoGP™ championship leader spent the day working on bike setup trying to improve the RC213V issues with acceleration out of slow corners. The Spaniard finished third in FP1, three-tenths of a second behind his teammate Dani Pedrosa who topped the session. Marquez improved in the afternoon by over a second, but could only manage third on the combined timesheets as he was forced to watch Jorge Lorenzo (Movistar Yamaha MotoGP) set a blistering pace in FP2. 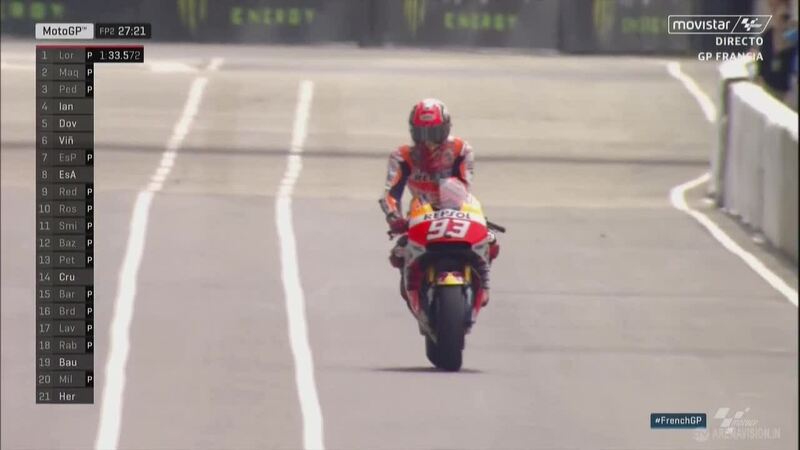 His time of 1’34.323 set right at the end of the day was good enough to secure third overall, but was almost half a second off the pace off Lorenzo’s pace. Jorge Lorenzo set a blistering pace as the reigning MotoGP™ World Champion topped Friday’s practice at Le Mans by 0.339s. 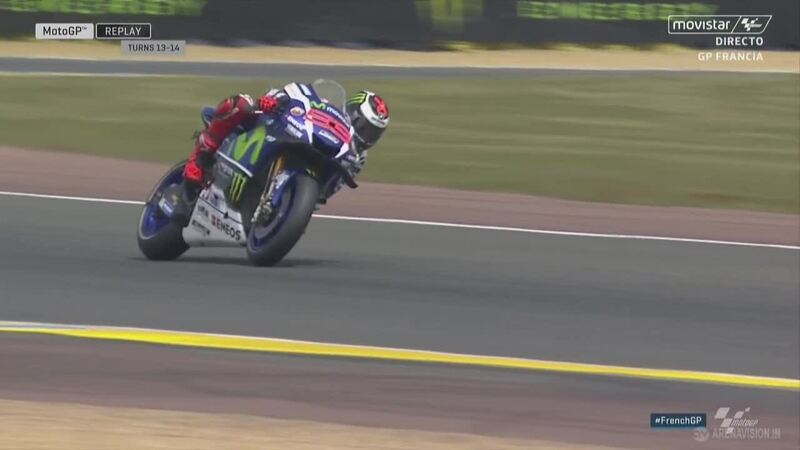 Movistar Yamaha MotoGP’s Jorge Lorenzo sent out a warning to his rivals buy showing ominous race pace at the Monster Energy Grand Prix de France during Friday’s Practice. 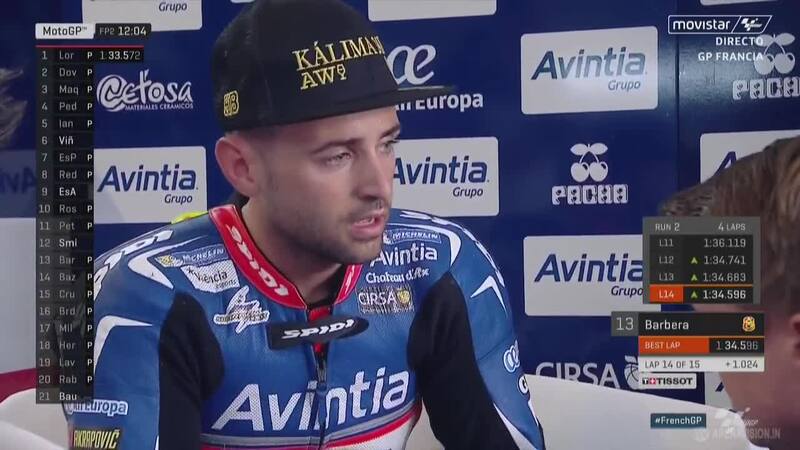 The just turned 29-year-old was the only rider to dip under the 1‘33s mark and finished over three-tenths ahead of Andrea Iannone (Ducati Team) in second. The Mallorcan had to play second fiddle to Dani Pedrosa in FP1 as he finished just 0.044s behind his compatriot with a 1’34.086 after on finding a good setting with his YZR-M1. Things would improve in the afternoon and it only took a couple of minutes for him to take over at the top the timesheets with a hot lap of 1‘33.572. Though already in the lead, he had one more trick up his sleeve. With the expectation that tomorrow‘s conditions might not be as good as today‘s, he gave a final push in the final minutes of the session to be assured of a spot in Q2 and set a brilliant 1‘32.830s lap to secure third as he looks to close the 17 point gap to championship leader Marc Marquez come Sunday’s race.